What is the largest organism on Earth? Simple enough question, take a shot at the answer – giant sequoia, blue whale – not even close. Ponder a 5.5 kilometer across honey fungus in Oregon, our largest terrestrial organism. Fungus inhabit the kingdom of Fungi. Neither plant or animal, science suspects member species of the fungal realm number in millions. Of 120,000 identified species – 300 are detrimental to humans, 8,000 attack plants, many more target animals. Before dismissing fungus as mushroom soup or nasty toenails, ponder a parasitic community boasting the largest organism on Earth. Science defines individual life forms as organisms comprised of genetically identical cells, able to communicate and share a common purpose. Weighing an estimated 600 tons, Oregon’s behemoth Honey Fungus passes the single organism test with flying colours. Don’t go looking for a giant mushroom, most of this fungal monstrosity lurks below ground. A parasitic giant, entwined underground in colonized tendrils intent on dissolving roots of conifer forests above. Fungi don’t photosynthesize, sustenance comes from absorbing nutrients dissolved by secretion of digestive enzymes. Science can’t say if it took two or eight thousand years for the world’s largest organism to occupy 2,384 acres, roughly the area of 1,665 football fields. 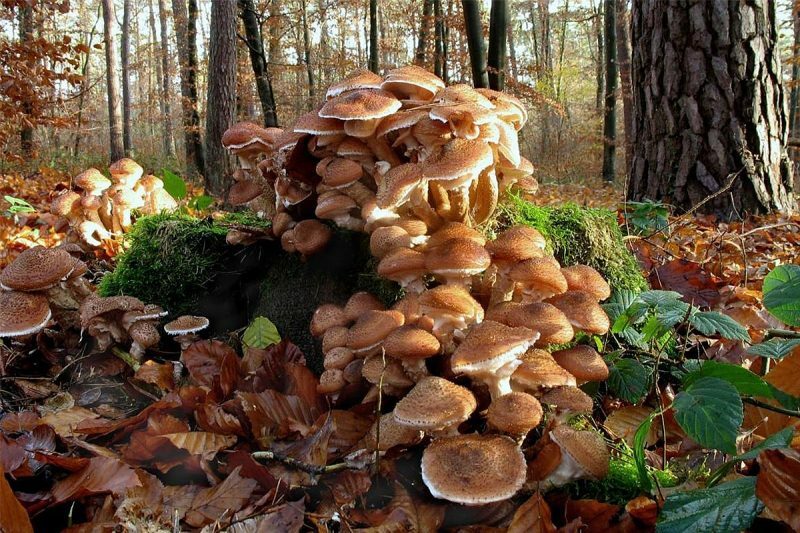 It can say the largest individual organism on Earth is a fungal parasite named Honey. A mysterious, organic matter dissolving monster capable of sucking life from all it touches. Fungi freak me out.